Welcome to Day 6 of 31 Days of Horror, where we’ll be discussing Universal’s first werewolf movie, Werewolf of London from 1935. I have to admit: Outside of that Warren Zevon song, I had never heard of Werewolf of London and had absolutely no idea there was any other werewolf film in Universal’s classic monster movies, outside of The Wolf Man series. That franchise (especially the first one) is so iconic, and casts such a long shadow over every other werewolf movie ever made, that is it almost unfathomable to even consider that Werewolf of London came first (and by half a decade at that!). It’s a shame, really, because this movie actually created many of the tropes that we now associate with werewolves, including the association with the full moon and being infected from a bite. This film even had the same makeup artist (Jack Pierce) work on both films, although he didn’t quite get to create the makeup he wanted to use for this one, so the two movies don’t actually look all that similar in that regard. Nor is the plot all that similar either. In this movie, Botanist Dr. Wilfred Glendon is in Tibet searching for a rare flower. Just as he discovers it, however, he is suddenly attacked and bitten by a werewolf who had been watching him from afar. Dr. Glendon is able to make it back to London where he attempts to do research on the flower (although to what end, I’m not entirely sure), but is having trouble getting it to bloom in his lab. He is soon visited by Dr. Yogami, who tells him that the flower is the only thing that can cure him of his “Lycanthropy” that was passed on to him when he was bit. But he must take it before the next full moon or there will be blood on his hands. It seems Dr. Yogami personally knows a great deal about this subject, but Dr. Glendon blows him off anyway. Sure enough, on the next full moon, he turns into a werewolf (in a very effective transformation sequence that surprisingly rivals that of anything in The Wolf Man), and goes on a murderous spree in London. If I’m being honest, I don’t actually love this movie, and it all has to do with Henry’s Hull portrayal of Dr. Glendon. He’s a jerk, through-and-through, and he’s far too obsessed with his work, and far too jealous of his wife and her ex-lover. Lon Chaney Jr. really sold the tortured aspect of his character in Wolf Man, which in turn made his character sympathetic. You got the sense that he couldn’t control what he was doing, and that he also didn’t want to hurt anyone. That’s not really the case here. In fact, it’s outright shown that Dr. Glendon is still somewhat human because even after he’s transformed into a werewolf, he takes time to put on a coat before he steps outside. I thought it was a goofy touch and totally counterintuitive to the dire circumstances that Dr. Yogami spoke of previously. This does, however, seem to suggest that being a werewolf in this film is more an expression of your inner demons and desires rather than a physical transformation into a completely different, out-of-control animal. Dr. Glendon is in control and yet wants to go attack specific people. It’s an interesting concept that I don’t think is fully explored. And then there are the two older women who rent him a room while he lays low. I don’t understand why this zany type of humor is needed at all, but it reminds me an awful lot of Una O’Connor’s character in both The Invisible Man and Bride of Frankenstein. Over-the-top doesn’t even begin to describe it, and like her, the two women here nearly ruin the entire movie for me every time they’re onscreen (which is way more than they should be anyway). 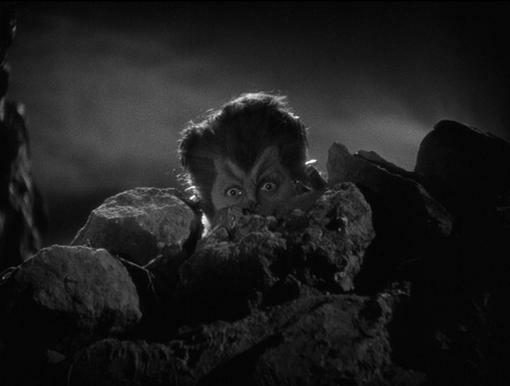 I should point out that I don’t love The Wolf Man, either, but I think the reason it’s remembered more clearly is because it’s, by almost all accounts, a better movie. Still, Werewolf of London has contributed significantly to werewolf mythology and that alone makes it a worthwhile film to check out. For Day 7 tomorrow, Kelley will kick off the 1940s by reviewing Dr. Jekyll and Mr. Hyde, so be sure and check that out as we continue 31 Days of Horror! !